Want to Lose Weight? 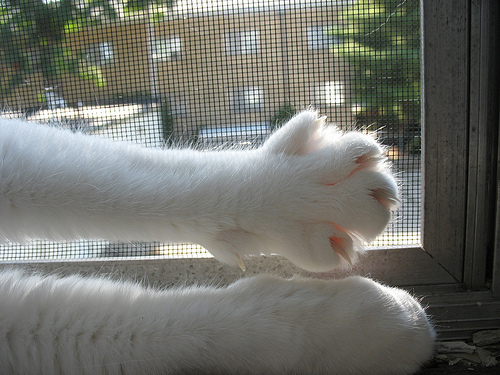 Talk to the Paw! From what I hear it’s bikini season, dolls. And guys. What do they call that plastic wrap thing some of you wear at the beach? I forget. A Speed-o. Ho ho. I am not purring at this thought for the most part. As you know, I do not wear a bikini – my soft pelt is fine all by itself and I need no other fashion but for the cut-up lime hat I wear on my head at times for astrological purposes. Nevertheless, the importance of being lithe is not minimal to a cat. And nor should it be to you humans. Yoga is always a good thing to do. But if you can’t do yoga whenever you want as I can (meow) then more must happen. Diets have been proven through history to be looming disasters of unhappiness and expense, the displeased rumbling tummies of many filling the coffers of a few as money is doled out for the supposed answer of “what to eat to lose weight”. Here is the answer: Talk to the paw. No paw? Sad. Use your hand instead. Five, count ’em, five pads (or fingers if you please) there. Look closely. Take one of those units and fold it under so that you do not see it. Look again. Is your paw (or hand) smaller? Yes! Yes it is. This is the answer to losing weight. I do it often, not because I need to lose weight (purrrrrr) but because it drives my mistress crazy. When the plate is placed before you to eat, take your paw and lay it upon it. Just so. Centered. Angle it slightly this way and that while squinting and making little mewing noises. When you have finally gotten everyone’s attention and they all think you are the most aggravating creature the world has yet seen then figure out how much less one-fifth of the serving size is. If the food is good, eat it (naturally you can always walk away if you simply don’t like it, waving your tail in a slightly miffed way) but LEAVE ONE FIFTH on the plate. They will think you are merely being picky. But if you do this often enough, very soon, very soon dolls – you will soon be one-fifth less the size you are now. One smart human guy has some more interesting ideas on all this – his name is Brian Wansink, and you can read a bit here at Mindless Eating.